One outrageously insolent remark was remarkably ignored in the hullaballoo generated by US President Barack Obama’s Bibi-bashing interview on the eve of Prime Minister Binyamin Netanyahu’s latest White House visit. Huh? Really? What restrictions? And does Obama now also presume to pass judgment on what are indisputably our domestic affairs? Is there no limit to his meddling and hubris? Again, it needs be stressed, the villain of Obama’s piece is ultra-liberal, ultra-pluralist and ultra-tolerant Israel. That unavoidably raises the question of whether America’s know-it-all-in-chief is at all aware of the shrill hysteria with which Israeli-Arabs denigrated Foreign Minister Avigdor Liberman’s idea of swapping Israel’s own Wadi Ara region with the Palestinian Authority. If anything, this indicates how desperately attached to their Israeli identity Israel’s Arab citizens are. Their reaction was hardly one of an oppressed minority, as Obama dishonestly and cheekily depicted them. If things are so bad for Arabs inside Israel (which is anyhow not Obama’s business), why are they so fond of their Israeli status? Perhaps things are nowhere as awful as he portrayed for demagogic purposes. Perhaps Israeli Arabs don’t really have it bad. Indeed, perhaps they have it very good. In fact, odds are that they’re better-off than any Arab population anywhere in the vast Arab world. And they know it. Pocketbook astuteness rules out the forfeit of economic benefits for the sake of ideology. Besides, where else on this planet can Arabs find courts as indulgent as in Israel? Here they can subvert and incite with impunity. Contrast Israeli excessive broadmindedness with Arab reigns of terror. By their refusal to become Palestinian citizens, Israel’s vocally antagonistic Arabs pay our democracy the highest compliment, despite their interminable carping about the Israeli flag, national anthem, emblems, etc. The swap would instantly remove all these Jewish annoyances from their eyes, ears and nostrils. That should surely eliminate their much-hyped angst, with which Obama so predictably sympathizes. Can there conceivably be a fairer solution than for them to opt for Palestinian citizenship? Moreover, Arabs claim they want to wrest territory from Israel, so why not wrest this specific tract? Herein hides the true Arab casus belli against the Jewish state. Everything else is window-dressing for the sake of brainwashing both at home and abroad. Forget all the babble and fleeting fad issues that grab headlines at any given time. There has always been only one trigger for the Israeli-Arab dispute and none other. It’s not about occupation, not about settlements and not even about refugees. It just never was. These were/are handy excuses that produced exceptional propaganda profit for their promoters at particular stages of the very conflict they created and fanned. The plain fact is that Arab animosity preceded all Arab pretexts for said animosity. Strip away the palaver and falsehoods and one theme remains constant throughout – opposition to the Jewish national revival in this land, i.e. opposition to our at all being here. Hence Ramallah’s adamant refusal to recognize the legitimacy of a Jewish state. Our Jewish national liberation is anathema to our enemies (who, according to Obamaesque diktats of political correctness, may not even be referred to as our enemies but as our victims). Once we understand this key underlying reality, all else becomes crystal clear and no further obfuscation is possible. Our minds cannot be messed with if we don’t lose sight of the vital truth – the truth that’s so inconvenient to myopic Obama, cynical Arab sloganeers, their European patrons and, not least, to Israel’s homegrown far-Left. The aforementioned relish in presenting Liberman’s swap proposal as an attempt to evict from their homes and exile the entire Arab population of cities like Umm el-Fahm. Expulsion is exclusively supportable only for Jews (as in the Disengagement or what is hoarsely clamored for regarding some 700,000 Jews in Judea and Samaria and entire quarters of Jerusalem). The swap idea, though, doesn’t involve expulsion as it’s verboten to dislodge a single Arab from anywhere. The idea is trading territory and in this particular barter the Palestinians would get land already populated by their kith and kin, by their loyal compatriots. No single Arab inhabitant would lose his/her home. This area, incidentally, was already exchanged before. It wasn’t part of original Israel but was attached to it after the War of Independence in a round of land swaps. So what’s wrong with another swap? One would actually expect the entire Arab world to enthusiastically welcome into Arab jurisdiction brethren whose cause it seemingly so fervently espouses. The aggressive rebuff of the notion is telling. It doesn’t at all matter whether we personally approve or disapprove of the swap, whether we consider it a pragmatic option or not. The vituperation with which it’s greeted is in itself enlightening and mustn’t be overlooked or belittled. It illuminates the oft-forgotten fundamentals. It exposes Arab lies. In the Arab lexicon, Israeli occupation is divided into two major categories – 1967 (following the Six Day War) and 1948 (following the coordinated invasion of day-old Israel by seven Arab armies). The 1948 category comprises the entire area of the Jewish state, deeming it all occupied territory and consequently illegitimate, despite occasional self-serving pretences to the contrary. Thus all Arabs living in sovereign pre-Six Day War Israel (be they in Jaffa, Haifa, Lod, Nazareth or Umm el-Fahm) are depicted as suffering harsh and prolonged Israeli occupation (a view to which Obama evidently subscribes). The perks of Israel’s uber-liberal democracy enable Israeli-Arabs to make no bones about their antipathy to the Jewish state, its flag, its anthem, its emblems, its identity, its very designation as the state of the Jewish people. In one position paper after another, Arab organizations bankrolled by leftist Jewish foundations (who themselves are recipients of largesse from the biased and interventionist EU), openly proclaim their aim to cleanse Israel of its Jewish connection, make it provisionally “a state of all its citizens,” an eventual candidate for out-and-out Arabization. Pro forma all these outfits claim that Israel’s Arab minority endures excruciating hardship and bitter discrimination under Israel’s heavy yoke. Why then so vehemently oppose their move to fraternal Palestinian jurisdiction? In one fell swoop, without the loss of any real estate, supposedly oppressed Israeli-Arabs would be liberated from Israel’s cruel rule and it would only be the border that shifts rather than them. It’s now that doubts creep in. The primary endgame against the Jewish collective decrees at this point in time that the Jewish distinction of Israel be undermined. The current spearhead for that is Israel’s Arab population. The bigger it is and the greater its proportion, the more it can argue that ours isn’t a Jewish state. That’s why all Arab regimes insist so passionately on the right to inundate Israel with untold millions of descendents of so-called Arab refugees. It’s not that homes cannot be found for them in the immense oil-glutted Arab realm, but that they aim to destabilize, demoralize, dislocate and finally displace us. That’s why the border cannot be redrawn and why Umm el-Fahm must remain Israeli. It has to function as a fifth column in our midst. The Arabs know this and in their own Arabic language discourse, for their own internal consumption, they boldly designate Israel’s Arab population as the catalyst for Israel’s dismantlement. As for the Israel’s leftist fringe, all red lines have been blurred long ago. Hypocrisy is the byword of the hardly gullible self-professed do-gooders who proliferate on the left-most margins of our political spectrum. They have a proven track record. They’re the very ones who serially scare public opinion against hanging on to even a scrap of territory won in the 1967 war of self-defense imposed upon us. Pointedly omitting mention of this country’s nine-mile wide waistline and the acute vulnerability of its densest population centers, leftists warn that Israel will lose its Jewish identity should it fail to forthwith divest itself of all its strategic assets. To hear them, since this country was indeed founded to afford Jews the one place on earth where they aren’t an endangered minority, even suicidal sacrifices are mandated to maintain said Jewish majority. It was in the name of this Jewish majority that the Left inflicted the Oslo folly upon us in 1993. 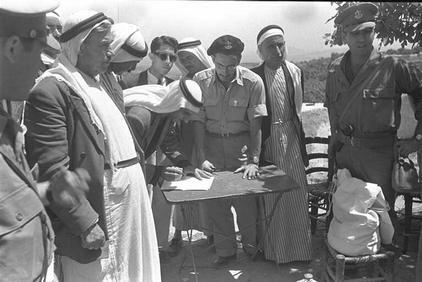 Yet few Israelis realize that as part of its Oslo undertakings Israel had admitted 150,000 Palestinian Arabs ostensibly to facilitate “family reunions.” Needless to say their numbers have since swelled and massively inflated Arab population proportions within Israel proper – all in the name of safeguarding the Jewish majority. The political Left, moreover, obsessively combats legislation geared to prevent an additional Arab influx into the Jewish state under the fraudulent guise of family reunions. The very notion that Israeli/Arab-Palestinian couples can “reunite” beyond the Green Line grievously offends our Left’s sensibilities. It hankers for the migration of ever-greater number of Arabs into our Jewish-majority midst – all in the name of that hallowed Jewish majority they purportedly champion. Simultaneously, leftist groups cannot abide the notion that Israel require its self-styled peace partners to recognize its legitimacy as a Jewish state rather than as an undefined de facto entity and a future Arab state whose name would in due course be changed as well as its ethnic make-up and character. However viewed, the common denominator between disingenuous leftwing catchphrases and contradictory leftwing actions is the weakening of Israel as a Jewish state. It’s time to acknowledge that anything which weakens Israel is eagerly espoused by leftwing manipulators – be it yielding territory to ever-implacable enemies, importing hostile Arabs, opposing legislation to reduce the danger of being overrun by would-be annihilators or even derailing efforts to diminish the illegal (mostly Muslim) deluge from Africa. According to leftist dogma, everyone has a right to our state – any enemy Arabs, Africans from wherever, Filipino opportunists, even outer Mongolians – just not Jews. Not us. And to sustain that inimical creed, Umm el-Fahm must stay a thorn in Israel’s flesh. This, sadly (if not tragically) is the agenda Obama furtively furthers with a preachy and slyly escalated insidious narrative. What about Caroline Glick’s Israeli one-state solution? I wonder what they would say if all the Jews in Israel threatened to leave en masse, and move to California? Then the Arabs could fight amongst themselves, as in Syria, and so on, and their world could slowly descend into H3ll. Let them all be damned dear Sarahleh, from the leftists, to the Arabs, right on down to “Bathhouse Barry”….aka….Barack Inssein Obama. I, of course fully agree dear uncle ! Among the Jews in my neck of the woods stateside, who cast their ballots well over the average mind-boggling 70 percent Jewish vote nationwide for Obama in 2012, it is highly disrespectful, indeed inflammatory, and yes, even sacrilegious, to suggest that He is the sly, furtive, dishonest, hostile menace to Israel that in His heart and mind and words and deeds He so obviously is. Perhaps inevitably, I understand other contries and cultures through my own. Historically the United States had two racial minorities, the Africans and the American Indians. The Africans were slaves, we took their labor. As such we didn’t kill them beyond what we needed for control and terrorization. We didn’t want the American Indians’ labor we wanted their land. We solved that by extermination and expulsion to reservations. European Jews didn’t have land but they did have something else the Europeans craved, our gold. Like what the Americans did to the Indians, they did to Jews. Expulsion to ghettos and eventually from countries. Finally we were destroyed. The Arabs treated us like the Americans did slaves. We were juiced of our jizya. They didn’t kill us, just humiliated us. The same is attempted by the Israeli Arabs, all considering they don’t have the control their ancestors had. They live far better than their brethren, yet collectively through their Zoabis and Salahs, they get to call us nasty names like racists, jailers and nazis. If the Jews in Israel ever come under the Arab thumb, what could we expect? Ordinarily, we’d be treated like dhimmi, giving jizya to our betters – like slaves, as before. But, should it ever come to pass that our resources, like our natural gas fields, become hugely important, we would be exterminated or expelled, just like the American Indian. “They didn’t kill us, just humiliated us.” Are you forgetting “The Farhud?” The anti-Jewish riot in 1941 Iraq, that destroyed the Jewish community of Baghdad? And the riots instigated by Haj-Amin Husseini, 1921-1936? Let’s put it plain and simple dear Sarah…it’s an ALL or NOTHING game and Israel holds all the trump cards, as Noodles just said: Let them all be damned ! Obumma is the darling of the sorry leftists and of the enemies of the Jewish state, but he is a weakling and can only rely on psychological pressure. The Israeli one-state solution has to be the end game. Israeli people need to know and understand that President Barack Hussein Obama and John Kerry do not reflect the opinions of all in our nation. There are millions of american christians who call Jerusalem their home and pray to Jesus for her protection and safety. “And I will bring again the captivity of my people of Israel, and they shall build the waste cities, and inhabit them; and they shall plant vineyards, and drink the wine thereof; they shall also may gardens, and eat the fruit of them. “Surely the Lord G-d will do nothing, but he revealeth his secret unto his servants the prophets” (Amos 3:7). Unite the Land. Establish the Law of HaShem. Annex Judea and Samaria.